Galaxies come in a large variety of shapes showing a large diversity of (sub-)structure ranging from spiral arms, bars and rings to distinct, e.g. lop-sided, disk components or even tidal tails. These structures are prominent in optical and near-infrared images of the stellar light arising from the galaxies. On the other hand observations of the gaseous and stellar kinematics can reveal even more hidden (sub-)structures such as counter-rotating disks or weak inner bars. The correct identification of photometric and kinematic structures in galaxies is key to link the distribution of the stellar mass that forms the backbone of the gravitational potential with the observed gaseous and stellar kinematics that show the response to the gravitational potential. This knowledge will allow for the study of the formation path of galaxies and thus also predictions of their fate. This project will utilize photometric substructures identified in near-infrared Spitzer space-telescope imaging as part of the S4G Survey (http://s4g.caltech.edu/) - the near-infrared is much less sensitive to dust extinction and a better tracers of old stellar populations than the optical. Kinematic information will be inferred from stellar and/or gaseous kinematics, derived from archival and newly obtained optical integral-field spectroscopic and Fabry-Perot interferometric data as well as radio interferometric neutral gas emission line data obtained as part of the DAGAL network. The linkage of the resulting photometric and kinematic substructures will provide a robust calibration of the structural information in S4G's very deep imaging and enable an investigation of main galaxy formation mechanisms with the potential use of dedicated simulations. 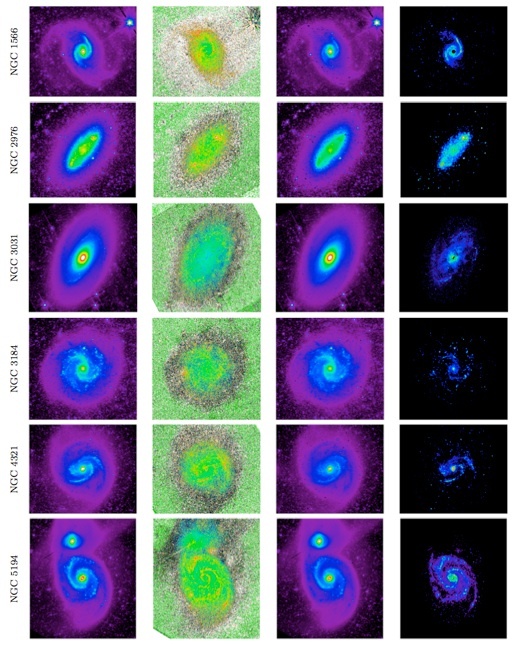 Structures in nearby galaxies as seen in their 3.6 micron light (from left to right; Meidt et al. 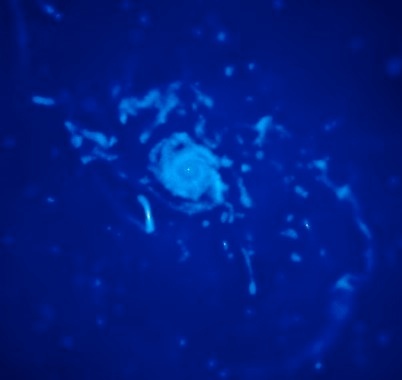 2011): total 3.6 micron emission, mid-infrared color showing spiral arms as substructure, 3.6 micron light arising from old stars only revealing the underlying gravitational potential, and 3.6 micron emission coming from dust showing the response of the interstellar material to the gravitational potential. 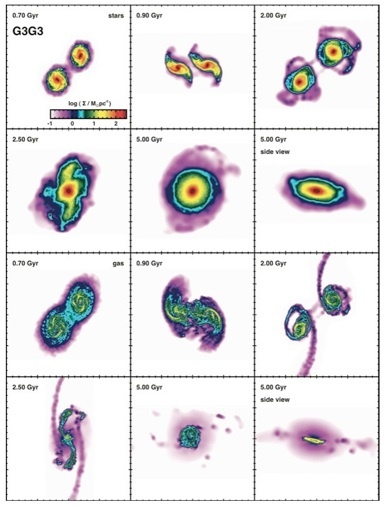 Gas distribution in a local spiral galaxies as predicted by cosmological simulations. The concordance cosmological model predicts that galaxies are embedded in extended dark matter distributions. Whereas in spiral galaxies neutral hydrogen rotation curves have provided evidence for dark matter already several decades ago, in elliptical galaxies the amount, let alone distribution, of dark matter is still hotly debated. In ellipticals (cold) gas is scarce, so that instead the kinematics of the stars ---a more complex tracer than gas--- have to be used. The combination of high quality integral-field spectroscopic data and general orbit-based dynamical models is currently state-of-the-art and allows one to accurately infer the total mass distribution of elliptical galaxies. However, the determination of the dark matter contribution is limited due to significant uncertainties in the conversion of stellar light into stellar mass and the according distribution. In this project, we plan to accurately measure the stellar mass distribution by using near-infrared Spitzer space-telescope imaging as part of the S4G Survey (http://s4g.caltech.edu/); the near-infrared being much less sensitive to dust extinction and better tracers of old stellar populations than the optical, combined with the depth of the S4G images, allows for precise determinations of the stellar mass distributions. We combine these with the total mass distribution derived from fits to two-dimensional stellar kinematics with our numerical implementation of Schwarzschild's orbit super-position method. The resulting dark matter distribution will be confronted with predictions from cosmological galaxy formation models. In addition, the Schwarzschild models also yield the stellar phase-space distribution function which can be compared directly with the numerical simulation to constrain the formation history of elliptical galaxies, including the importance of minor versus major galaxy mergers and gas-poor (i.e. dry) versus gas-rich (i.e. wet) ones. elliptical galaxy NGC 4365 obtained with the IFU SAURON (top row) accurately fitted with our numerical implementation of Schwarzschild's orbit superposition method in triaxial geometry (bottom row). From left to right: mean line-of-sight velocity and dispersion, and higher-order Gauss-Hermite velocity moments, which quantify deviations from a Gaussian velocity profile. Black contours are isophotes derived from Hubble Space Telescope imaging of NGC 4365 (right; the magenta box indicates the extent of the SAURON observations). The imaging shows a smooth elliptical luminosity distribution, but the kinematics reveal a complex non-axisymmetric orbital distribution with an (apparent) kinematically decoupled core (van den Bosch et al. 2008). Cosmological simulation of the time evolution of a major galaxy merger (Moster et al. 2011) showing the distribution of the stars (top two rows) and the gas (bottom two rows).